William Morrow Cookbooks, 9780060731243, 288pp. Recipes. Cooking all comes down to the recipes -- those ingredient-by-ingredient, technique-by-technique, step-by-step instructions. 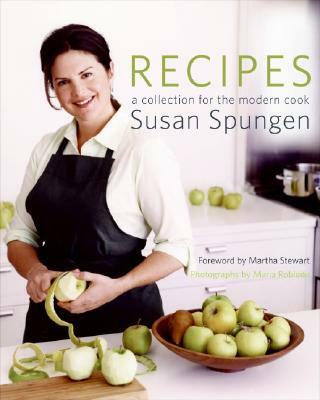 In Recipes, Susan Spungen, founding food editor and editorial director for food at Martha Stewart Living Omnimedia for twelve years, presents her own easy, unfettered ideas for cooking simple food rich with freshness and flavors to share with family and friends. Recipes is organized by technique, explaining why sautéing is great for two or four but when feeding a crowd braising is the better choice. "Prepare" focuses on the basics, from making a vinaigrette to roasting garlic and peppers. "Chop" includes not just salads, but gazpacho and a Provençal sandwich that requires knife skills. "Sauté" explains how to pan-sear fish and make a layered omelet. "Grill" shows proper techniques for cooking scallops, asparagus, and steak over an open fire. "Roast" offers the perfect roast chicken and a roasted squash salad. "Bake" features a variety of pizzas as well as mushrooms baked in parchment paper. "Simmer and Braise" coaxes the most flavors from soups and lamb shanks. Finally, there's "Indulge," a selection of desserts from simple brownies and peach melba to a fruit crisp and a rich chocolate cake. Susan believes that one of the most pleasurable parts of a meal should be the making of it. Recipes encourages home cooks to become confident cooks. Susan Spungen was the founding food editor and editorial director for food at Martha Stewart Living Omnimedia from its launch in 1991 until 2003. She wrote a bimonthly column called "Easy Entertaining" for the magazine until June 2004, and helped launch MSO's first all-food title, Everyday Food. She is coauthor of the best-selling Martha Stewart's Hors d'Oeuvres Handbook. She lives in New York City.